World Smile Day® will be celebrated on Friday October 02, 2015. This year's theme is "Do an act of kindness. Help one person smile!". People around the world embrace this theme and on WSD organize events and celebrations big and small, visible and unseen at thier school, business, organization, community or just within their family. 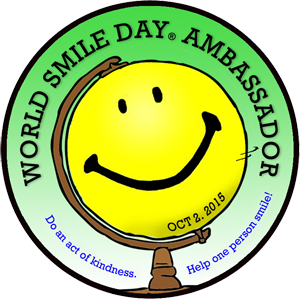 We recognize those that particpate in the day with the title "World Smile Day® Ambassadors". And anyone can be one - young or old, male or female, from any walk of life, from anywhere in the world. All that really matters is the person is aware of World Smile Day® and our theme and then works to help achieve our goal in the best manner appropriate to their location and interest. Not matter what you do or how formal your involvement we ask everyone to be a World Smile Day® Ambassador and help spread the word about World Smile Day® and then make spreading smles and kind acts a part of their daily routine.